My Bollywood education continues. 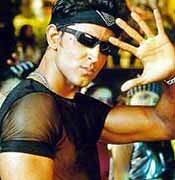 KNPH, Hrithik Roshan's debut, is discussed throughout Bollywood Boy, and now I feel up to speed. There is a major plot point that, perhas due to bad subtitling, was not clear and remains unanswered, but everything wrapped up happily enough that I don't mind too much. Overall v enjoyable and quite in keeping with the general Bollywood formula, although with some action thrown in. Best action sequence: in a warehouse where his beloved is being held captive by gunmen who want to kill him too, Hrithik leaps off a balcony, lunges for a chain dangling from the ceiling, and swings on it, Tarzaan-style, across the room, and kicks the captors in the head, knocking them down and scattering their guns on the floor - then on the return swing he swoops her up to safety. I also really liked the little exchange between the two leads when - wacky misunderstanding alert! - her father tells her that her birthday present is waiting for her outside, and she thinks that the present is Hrithik, when in fact it is the car he has delivered to her house (which she somehow doesn't notice, I guess because she is too dazzled by his beauty? ), and she proceeds to answer her father's questions about how she likes the present, isn't it pretty, does she want to try it out, etc. Somehow the actors handled this subtly enough to be really funny. In particular, he managed to express in his face and gestures 1) slight deference to the woman who is clearly his social better, 2) happiness at seeing her again (they had a previous flirty encounter on the street, as he rode his bicycle to work and was smitten with her through her car window), 3) general flirtiness, 4) mock frustration at being mistaken for the present, and 5) the teensiest bit of arrogance, knowing that indeed he is quite handsome and that she should be interested in him, even though he is a car salesman and she is a Big Businessman's daughter, because, after all, he can dance like the dickens and love conquers all. Perhaps due to a childhood love of The Sound of Music, I love how these movies like to focus on people spinning around, arms outstretched, on some piece of beautiful scenery, be it a Himalayan hillside or ocean-going yacht or tropical shore, rejoicing and exalting love, fate, wet clothes, great choreography, whatever. We should all do that more often. which I definitely do not. He was much better looking in the chinos and button-down shirt. Preppy, please. indya.com has a really funny article about Hrithik in this movie and it comments specifically on the dancing. The more of these I watch, the more I realize that what I love most is their whole-heartedness and their willingness to be happy on a grand scale that encompasses everyone, not just the romantic pair but their families, the landscape, an entire town. The happiness may be driven by True Love That Conquers All, Even Class Difference and Death and Sappy Face-Making, but it radiates over everything in its path.